Temporary Help Service. Wanted: Women. Phone Today - GA 5-7010. 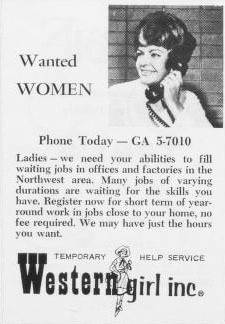 Ladies - we need your abilities to fill waiting jobs in offices and factories in the Northwest Area. Many jobs of varying durations are waiting for the skills you have. Register now for short term or year-round work in jobs close to your home, no fee required. We may have just the hours you want.